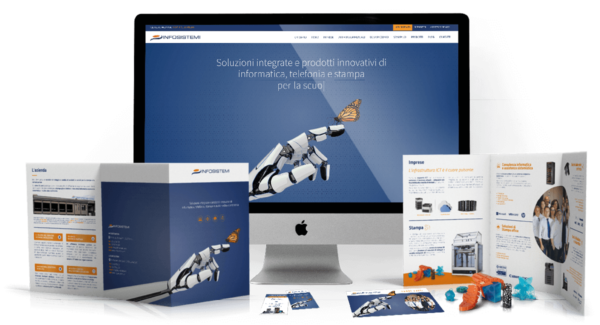 Infosistemi has been providing IT services, telephony services and digital printing solutions to schools, businesses and small and large companies in the Piedmont and Liguria area for over thirty years. Following an initial customer-supplier period, the company asked us to take care of its brand image by proposing activities that could renew it, with the certainty that as customers, we would do so with knowledge of the facts, suggesting effective and organizationally sustainable activities. An integrated communication project that has involved our team in different activities, starting from an integrated brochure system, coordinated by restyling the main commercial printings and the website.